What is gluten and why is it so harmful? If I don’t have celiac disease, do I need to worry about being gluten-free? What are other sources of similar compounds? Are gluten-free products really better for me? But unlike those people, you’re a well-informed Whole9 reader who doesn’t follow dietary recommendations based on a whim and likes to be able to explain why you choose to eat the way you do. With that in mind, let’s answer some of these questions. Gluten is a two-part protein composite that is found in many grains, but most famously in wheat. It consists of a prolamin and a glutelin. Prolamins are storage proteins, and they are the “hardware stores” of the wheat structure that distribute amino acids central to the plant’s development. Glutelin is the “glue” that holds these hardware stores together. These proteins are essential to the existence of these grains, but as we’ll explore further, that is also the same characteristic that makes them so harmful to our bodies. 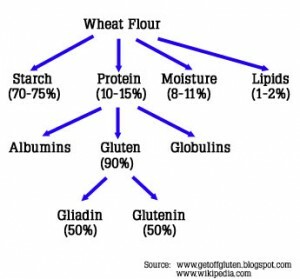 Wheat gluten itself consists of the prolamin gliadin and the glutelin glutenin (thanks for your confusing naming conventions, scientists!). Gliadin has been implicated as the main environmental factor in causing Celiac disease, when combined with specific genetic factors. Glutenin is the leading cause in the development of a wheat allergy. While these two proteins are the most likely to have a negative effect on the human body, they are far from the only potentially problematic compounds. It turns out that the majority of grains have a structure similar to that of wheat, namely one part prolamin, one part glutelin. There are many other prolamins out there: hordein (barley); secadin (rye); zein (corn); orzenin (rice); avenin (oats); panicin (millet); and a few others. These other prolamins are poorly researched compared to gliadin, and their effect on the body is not well-understood. There are also an equal number of grain-specific glutelins that pose an allergy risk as well. So how exactly does gliadin harm us? Well, it depends on who you are. If you have diagnosed Celiac disease, then the effects of gliadin and some of the more heinous prolamins (hordein & secadin) are readily apparent in the form of diarrhea, bloating, nutrient malabsorption and a whole host of other things you can read about here. Gliadin accomplishes this by stimulating zonulin, the traffic cop of the gut lining, to allow it to pass into our digestive tract largely undigested and interacting with tissue transglutaminase (tTG), an enzyme found throughout the body. Tissue transglutaminase is a critical part of how the body functions, and specifically, how the tight junctions in the microvilli (think hairy fingers) in our gut are formed. But when tTG interacts with gliadin, there is a potential to create antibodies, and suddenly, that enzyme that is such an important part of our body is now seen as an enemy. And that’s why people with Celiac disease see such strong reactions: their bodies are literally attacking themselves. So if you don’t have antibodies to tTG then you’re fine, right? Not so fast! There are 7 other types of transglutaminase enzymes in the body, all of which have the ability to turn against you via autoantibodies. The gliadin-tTG interaction is just the best studied of these. And current Celiac tests are only testing for antibodies to tTG, not to any of these other enzymes. So even if you test negative for antibodies to tTG, you certainly could have a variant that is still causing damage to your tight junctions. In some people, a reaction to gliadin may go unperceived because the symptoms are not as apparent as it is in those with Celiac. With gluten intolerance, you can potentially exhibit all the same symptoms as someone with Celiac, in addition to things like weight gain and mental disorders. Science is awesome, but it won’t change the fact that we are not well-adapted to grains. Gliadin and glutenin are certainly the most problematic components of wheat but they are far from the only ones, and their analogues in other grains may cause issues as well. I haven’t even talked about lectins, phytates, opiod peptides, fructans, insulin response, and cross-reactivities with foods like dairy! Because there are so many problematic compounds in all grains, we (Whole9 and friends) have found that an across-the-board elimination of all grains is more beneficial to long-term health than cherry-picking grains to eat. A 30-day (minimum) elimination is needed to help you assess what effect these compounds have on your body; after the 30 days, you’re free to play detective and try to figure out what foods cause you problems. (But in all honesty, no food is worth a reduced quality of life.) Thankfully, the Whole30 is a well-defined 30-day elimination plan that will help you establish a baseline free of these triggers. What about corn and rice? Reactions to grain consumption vary from person to person. Some people seem to tolerate gliadin “just fine”, others can’t handle the slightest exposure. These are two extremes of the same bell curve; the majority of people will have some trouble tolerating some of the various grains. Personally, I find that I don’t tolerate any grains well, and I find it much easier to avoid all of them rather than make exceptions for any. The reason it’s so tough for scientists to prove causation is that there are just so many darn variables to track. If you’re experimenting with grains, don’t eat them with dairy and sugar as well. Because if you do have an adverse reaction, you won’t be able to point to a singular cause. Also, don’t convince yourself that you do not have a reaction to a food just because you desperately want to eat that food. I tried to do that to myself with rice because I was tired of not being able to eat sushi, and it ended up with me bloated and miserable. Remember, no food is worth reduced quality of life. I’m a full-blown sashimi man these days! If you feel the need to occasionally Off-Road Nutritionally, pick a recipe out of one of the popular Paleo cookbooks instead of reaching for a fake, heavily processed food. You’re fine now, but how about when you’re older? Unfortunately, our ability to digest certain foods drops over time and our propensity to develop food intolerances and immune dysfunctions increases over time as long as that exposure is still there. This means that it’s not only smart to avoid the foods that make you less healthy now, but also later in life when you would ordinarily have more trouble with digestion. Also, remember how I mentioned that development of autoimmune conditions like Celiac require a genetic cue and an environmental cue? You better believe that you become more susceptible to these conditions the more grains you consume as your digestion worsens. And lastly, even “properly prepared grains” can only effectively reduced one or two of several problematic compounds found in the grains. It seriously is better to just avoid them all together. Hopefully I’ve given you enough information (without making your head explode) to explain to your friends that you’re not following some trendy gluten-free diet, but are investing in your health now and for the future. By eliminating the consumption of all grains, you really can improve your quality of life immediately by removing a number of potentially problematic compounds. Badier Velji runs The Lazy Caveman Health and Wellness in beautiful Mountain View, CA. In addition to coaching personal clients, he is active in the SF Bay Area Paleo community, runs the Nutrition Program at CrossFit Palo Alto and is a moderator at the Robb Wolf Forums. If you’d like to get started on changing your life today, email him at contact@thelazycaveman.com. As someone who is double gene gluten sensitive, and have 3 celiac children and husband, I think it’s important not to mislead your readers: wheat is not the only grain that contains gluten. If a newbie comes across your site, they may be confused. Other gluten grains include: barley, rye, spelt, triticale and kamut. Stephanie, he did write “Gluten is a two-part protein composite that is found in many grains.” If you get into listing which do and do not contain gluten, then you’ve written just another article that says it’s fine to eat the ones that don’t contain gluten, but that’s not the goal of the article. I think the takeaway is that avoiding only grains that are gluten free is not enough. I have two friends with celiac; one gets similar reactions to many other grains, including corn, and even from beef that’s been fed grains, while the other “seams to do fine” by just avoiding gluten, specificially. Long term, who knows how well she’s really doing? Maybe she’d be even better in the long run without other grains. As a diagnosed Celiac I find it really annoying that celebs are adopting the gluten free lifestyle as some kind of trendy way of eating and now the followers of those celebs are doing the same. I like the article, it was informative and well researched. I agree that it is probably best to avoid almost all grains not just the ones with the biggest immediate reaction. I have been looking into the processed gluten free foods and they have a lot of additives as well as being high in sugar and saturated fats. I have started experimenting making my own gluten free bakes with great success……and often it tastes much better and is cheaper than the processed version. Nicely done ;). I love the ‘off road’ advice. It is the hardest thing for my clients. When you realize that a ‘treat’ doesn’t have to be full of fake foods or junk, it really becomes something to savor, sweet or not. Well…. rather than looking at antibodies researcher might want to have a look at the extra-sensitive CRP-test. It is predictive for cardiovascular disease, also cancer risk I think, but is usually not used because individual variation is greater than the differences you are looking for. Test before and after a whole30. Compare delta from multiple people, remember good controls, preferably also examine if you can increase inflammation by putting people on an anti-whole30 diet. Statins are today widely suspected of improving life-expectancy not through their cholesterol lowering effect but by reducing systemic inflammation. @Stephanie Yes, you’re correct, all those other grains do contain gluten, but as Roland pointed out, I’m trying to make sure folks understand that not all gluten is created equal and that some compounds that aren’t called gluten exhibit very similar properties in our bodies. @Morten G CRP is a great marker to tell you that something is going on, but unfortunately, since so many things can cause elevated CRP, many physicians are afraid to use it because it won’t give them a specific diagnosis that they can treat. I totally agree with that you should get it tested pre- and post-Whole30 though. @Kevin: We don’t think it’s the healthiest choice. 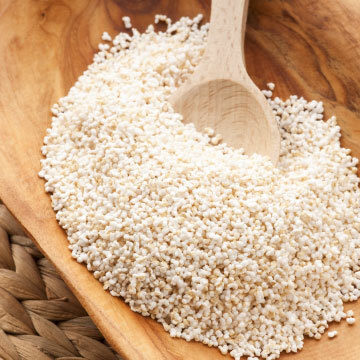 For all intents and purposes, we treat quinoa like any other grain (even though, botanically, it’s in a different family). I’ve done a cursory search, but could use some help. Anyone have good links/info on the problems of heating oils, particularly olive oil? Our concerns with heating oils with a moderate to high amount of PUFA (like EVOO) is that the PUFA fraction is vulnerable to oxidation when exposed to air and heat. The oxidation process first destroys any good, healthy compounds found in the oil (like antioxidants), and some studies reflect that ingestion of oxidated end products (such as those found in rancid oils) contribute substantially to inflammation in the body. (We’ve seen studies, however, that suggest that consumption of fats that are oxidized OUTSIDE of the body aren’t anywhere near as problematic as consumption of fats that oxidize INSIDE the body… but that still doesn’t mean oxidized vegetable oils or olive oils are good for you). Using cooking oils that have a significant PUFA component at high heat for long periods of time isn’t your best bet. Use those fats that are primarily saturated for cooking, and save olive oil for cooking on low heat, or when using the “wet saute” method. What a timely post. This goes well with my reading of Wheat Belly. Very interesting, everybody! As a 54 yr old Celiac diagnosed just 2 yrs ago, after being sick for the previous 4 (following sinus surgery), I see there is still much for me to learn. Thank you all for your meaningful contributions, author included. My extra problem with Celiac is the much less frequently accompanying skin problem, Dermatitis Herpetiformis (sp?). There is so little information out there, that I feel like I know more than any dermatologist I have seen. Scary! And since these annoying unattractive ‘spots’ last for months as they re-generate in place, sometimes going through numerous cycles before finally ending, it’s hard to know what to attribute them too. After reading this, I wonder if I may have a problem with other grains as well. Does anyone out there have any authenticated information and/or source regarding DH that I could learn from? Lisa, we don’t have any specific information on DH here on the site, but I bet if you Googled the term + Paleo, you could find others who have made the switch and found relief. I would not be at all surprised if you reacted to other grains (or dairy) as a Celiac – so many of our clients with Celiac cross-react with other inflammatory foods. I find once you get started, it’s pretty easy to stay away from gluten based foods. The real trick is actually doing it. Also, some of the grain alternatives are quite tasty. The most basic reason that GF diets are ‘trendy’ is because most people think that they’re getting away from the SAD (Standard American Diet) when, in reality, it’s just a minor tweak. People don’t know how to eat healthfully especially for their own current state of being. @Lisa – reactions to something consumed can ‘come out’ on the skin. So yes, there’s a good chance that your skin issue is related to something that you’re eating. It could be dairy as the dairy protein is quite similar to that of gluten. But perhaps something else that you’re overeating or just simply doesn’t agree with you. Sounds like experiment time with your diet! It could also be gluten (are you sure you’ve 100% gotten it all out?) which can hide in home and bodycare products as well that you’re reacting to. You could be accidentally ingesting them or perhaps even having a reaction on your skin to them.